HAIFA, Israel — Tamim Zoabi knew that if he and his classmates could win at the Young Engineers’ Conference, it could mean a ticket to a better life – a coveted university scholarship for this truck driver’s son from a poor village in northern Israel. But no Arab team had ever won at the conference, a competition among Israeli high school entrepreneurs to come up with the best high-tech startup idea. Zoabi grew up a world away from Israel’s thrumming high-tech scene, with its hyper ambitious entrepreneurs and millions in venture capital. Though his school is focused on technology studies, it lacks many of the resources needed to help students develop the kind of app Zoabi and his teammates hoped to enter in the competition. Even reliable Internet access is hard to come by. On the day of the conference, Zoabi’s team’s stood near a helmet that manipulated brain waves to alleviate depression and down the row from a prototype for a robot that detects land mines. Their presentation was a 3-D diorama of a neighborhood with a toy firetruck. But when the judge’s verdict was announced on Feb. 23, Zoabi and teammates Ruaa Omari and Masar Zoabi (no relation), had achieved something unprecedented for a group of Arab students: They won third place. Zoabi and his teammates are students at Bustan El-Marj Sci Tech High School, part of the Israel Sci-Tech Network of high schools, which aims to narrow achievement gaps by providing science education to students of diverse economic backgrounds. Tamim Zoabi’s father is a tow-truck driver and seasonal farm laborer, while Omari’s is a handyman. Masar Zoabi’s father died this year, and her mother does not work. Competitors in the conference work on everything from biomedical devices to military technology, but the Bustan team put its efforts into addressing a local problem. Each year, forest fires ravage the area where they live, a cluster of impoverished villages near Nazareth in the Galilee. Sometimes the fires burn for hours before their local understaffed fire department is able to extinguish them. At first, the team set an ambitious goal: to build a robot that could enter a blaze and begin to fight it. They were supposed to begin the project halfway through 11th grade, but their school couldn’t afford the necessary resources or budget class time for the project. So they scaled back, focusing instead on an app capable of locating the nearest fire hydrant and identifying the fastest route for firefighters to get there. Beginning in their senior year, the team was given eight hours of class time per week to work on the project. But the lab at their school had unreliable Internet access, so they used their teacher’s cellphone as a hotspot. Team members also faced the challenge of writing a scientific abstract in Hebrew, their second language. 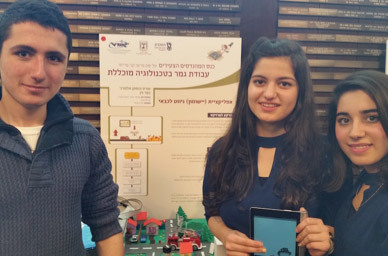 The team placed behind a system for monitoring abdominal aneurysms and an automatic-transmission bicycle, but third prize was still good enough for a partial scholarship to study science, technology, engineering or math at an Israeli university.